The pictures make it easy for even smaller children to understand, and they can search for animals and other details on the pictures. The story invites to discussions around what is right and wrong, and the consequences of our decisions. It has an open ending and is therefore well suited for discussions in the classroom or at home. 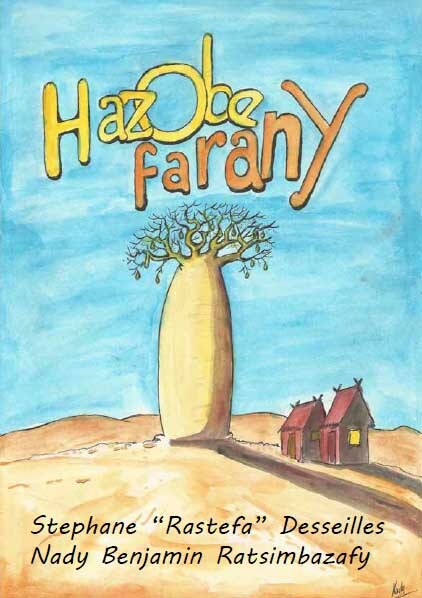 This book contains 9 fairytales from the Bara region in Madagascar. The Bara people are a marginalised and remote group of people with their distinct traditions and culture which is very little known in other parts of the island. The fairytales are told and illustrated colourfully by children between 9 and 12 years of age. They have been transcribed into official Malagasy language. Most are funny, but some will also make you think a little bit. “Tsingolangola” is an invented name for a bird that appears in one of the fairytales. Three siblings once found three eggs and brought them home. When the birds hatched, they became their most precious friends. 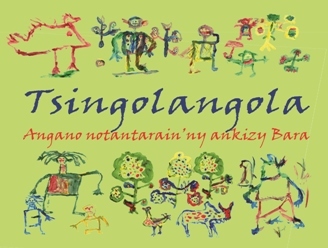 Especially the youngest child was attached to his “Tsingolangola”. But his mother tricked him and cooked the bird for dinner... The end of the fairytale is very sad and shows that parents should never underestimate the emotions of their children! This autobiography tells the story of a young mother who went to Lebanon in hope of earning some money for her family by doing domestic work. It soon appeared to her that what she had been promised – wages, good working conditions, sick leave, etc. – was not fulfilled. Instead she was mistreated and exploited like so many other victims of human trafficking. The author reflects around issues of dignity, respect and human rights, and her story will hopefully help to illuminate the growing problem of human trafficking. She also wishes to prevent that other young women are being tricked into the same situation as she was. This was the main motivation for her to publish the book, despite the risks it contains to openly criticize the way human trafficking is being neglected by authorities. The introduction to the book is also in French. 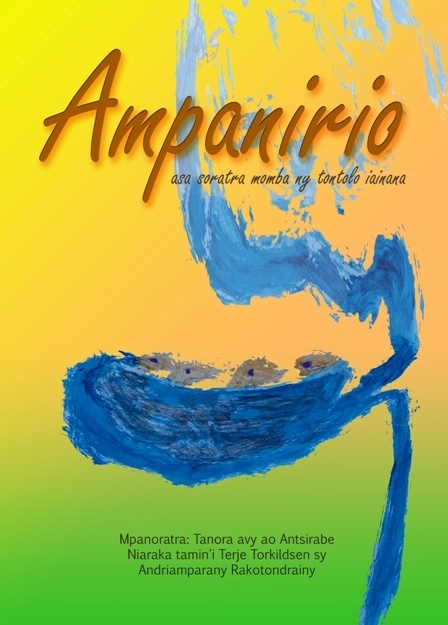 The theme of the book is the girl Todisoa and her family’s struggle with being poor in Madagascar’s capital Antananarivo. The story gives the people living on the street a face and a name, and opens the reader’s heart and mind for those forgotten people. Furthermore, it shows how mature girls sometimes have to be. 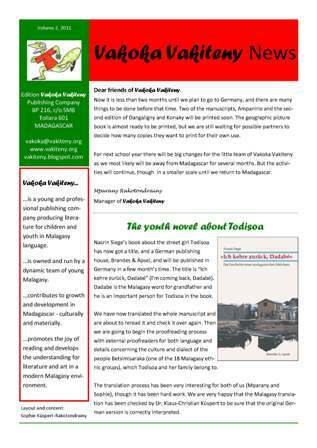 The book’s protagonist, the 12-year old Todisoa is the one holding the family together, supporting her parents, encouraging her younger brothers and makes them master the difficulties. External link to the author Nasrin Siege’s web page. 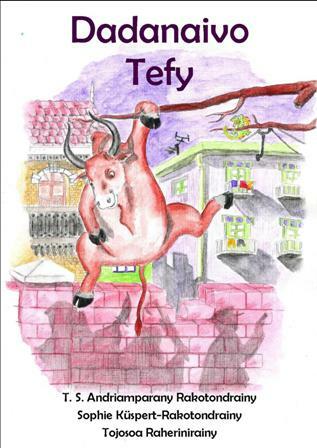 The bull Tefy is uncle (dadanaivo) to many calves, to whom he tells many stories in the evening under the big tamarind tree. The story he tells this evening is about his adventures to the island Zanzibar. The adventure began when he made a big demonstration against bush fires and afterwards broke free from the slaughterhouse and hitchhike with a taxi brousse. Finally he comes to Zanzibar after being hunted by a naïve gendarme and a very angry old lady. And then he wants to come back, but how? This book is a funny book with many colorful pictures showing Uncle Tefy’s various appearances, for example dressed as a lady. This can make both children and adults laugh. But even if it is a funny book there are some more serious themes lying underneath, for example the way people treat cattle. It acts mostly in Madagascar, but has some scenes from Zanzibar to give the reader a glimpse of the way of living outside the island. 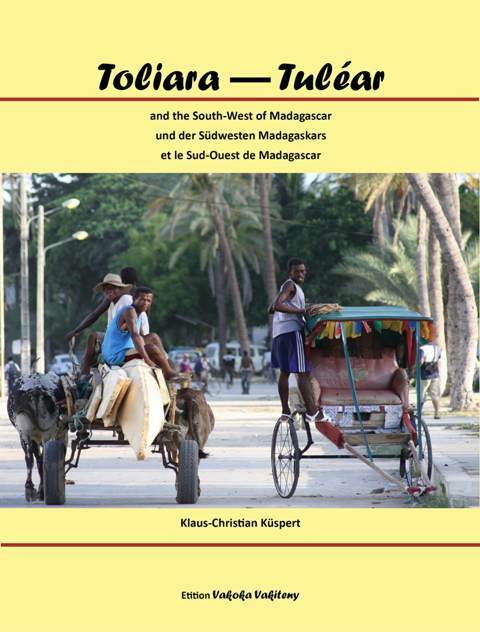 The story of Dangaligny starts in Toliara, the harbour town far southwest on the island. Here the cheeky and curious little lizard goes on its	involuntary and adventurous trip to the rainforest east on the island. He will be mobbed of other animals, cry of loneliness and get to know the little girl Konaky. Slowly they become friends and together they return to Toliara – rich in new experiences. This is a good story with particularly amazing illustrations and a lot of things to discover - for all ages! This book spreads joy and encourages for more reading. 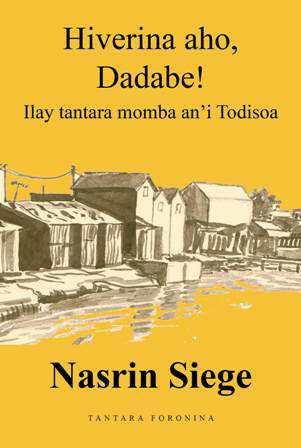 It impressively shows that it is possible to write modern and funny books in Malagasy acting in a Malagasy environment. Rebila - te hanidina ve ianao? A flying mouse? Rebila has a fixed idea – he wants to fly like his friend Rikibitiky, the little kingfisher. Rebila has to stand many trials and defeats. And how does it finally end? An easy reading book with funny pictures and a clear message from Rebila: “Keep on it! Don’t give up! Keep on trying until you succeed and your dreams become reality. A book for children who just have learned to read. 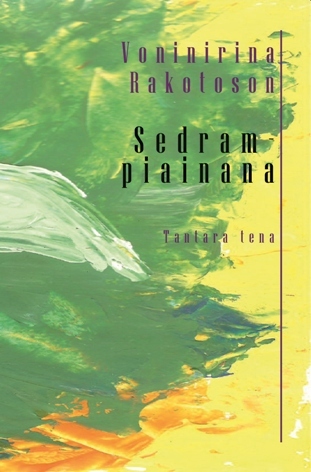 This book tells the story of the little boy Takoboka who loves his oxen, the nature - and who wants to go to school. But school is not as easy and funny as Takoboka expected it to be, and soon he gets enemies - one of them is he himself! A book about school and environment - but most of all a book a book about a boy who looks for his place in the society. This book deals with many subjects children on this age are concerned with and gives a lot of possibility for identification. It emphasizes the importance of the protection of the environment in a way that goes directly to the hearts of young people.